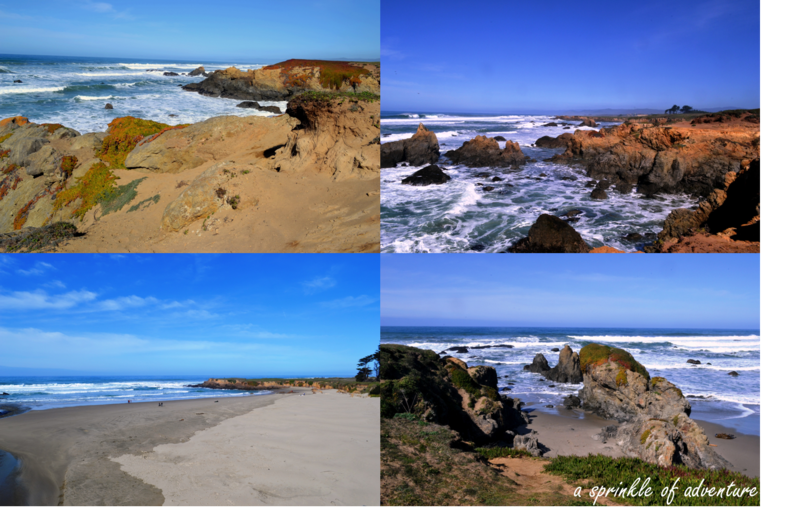 The hubs and I celebrated our 3-day President’s Day weekend with a getaway trip to Mendocino. I’ve been wanting to check out this northern coastal town for a while now and I’m so glad we went. Mendocino is like stepping back in time, the pace is a little slower, the people are friendlier, and the landscape is amazingly raw and beautiful. 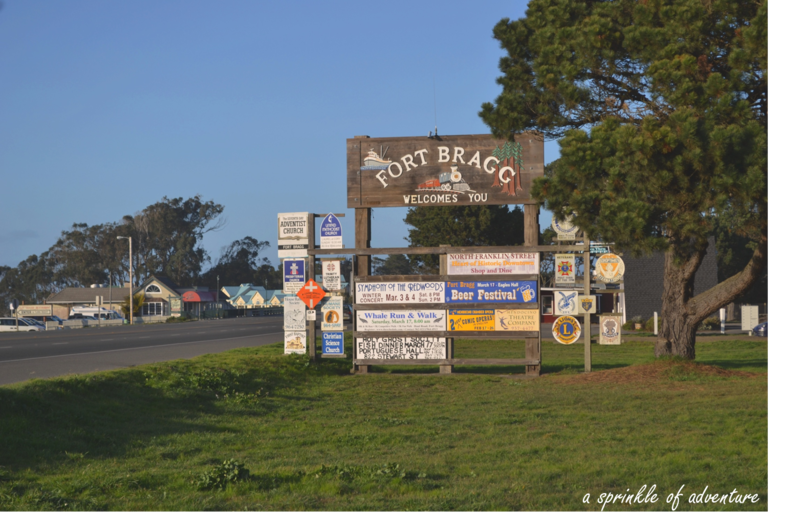 We stayed in Fort Bragg, a bigger city just 10 miles north of Mendocino. 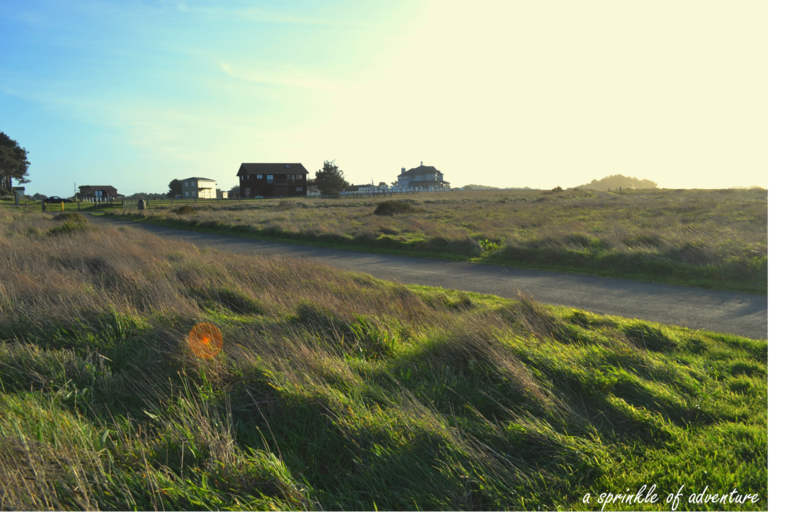 It’s not as quaint as Mendocino but offers great coastal trails, cheaper lodging options, and a less touristy feel. Although I would’ve loved to stay at one of the B&B’s, we opted for a more economical option since we were also bringing along our goldie. At $60 per night and a $10 pet fee, Super 8 Motel was just what needed, simple and clean accommodations at a good price. And across from the Super 8 Motel, there’s a trail right by the Cliff House where you can walk you dog and take in the fresh ocean air. We went to Cafe Beaujolais for an early dinner since we didn’t make reservations. 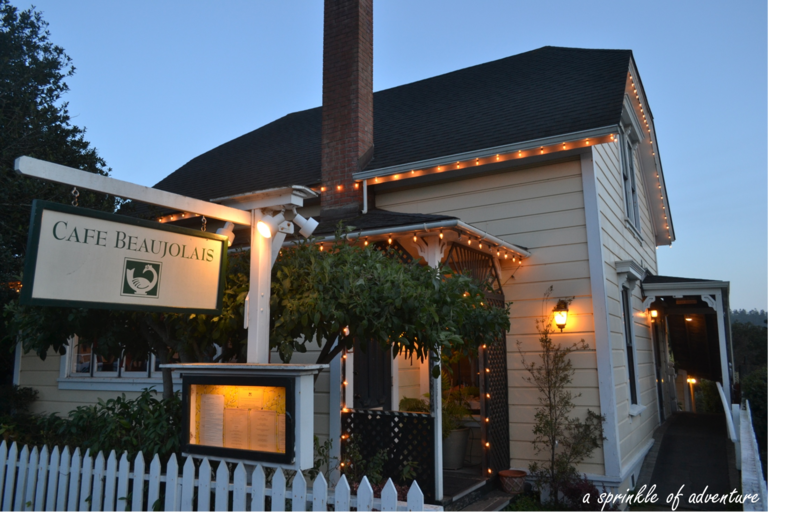 Cafe Beaujolais is an intimate French restaurant that focuses on local, seasonal ingredients. Everything about our meal was amazing. For appetizers we had the soup of the day, which was a creamy tomato bisque and the local Dungeness crab cakes. Entrees were the Niman Ranch steak and the Kurobuta pork chop. And for dessert we shared the flourless Callebaut chocolate lava cake, which was a mistake since I wanted it all to myself! The restaurant is a must for anyone visiting Mendocino and I highly recommend you make reservations, unless you are willing to eat dinner at 5:30pm like we did. We started our second day with brunch at Eggheads and coffee from Headland’s Coffeehouse. Eggheads is your typical no frills neighborhood breakfast joint. They’re known for their kitschy Wizard of Oz decor and their large variety of omelets. The hubs had the house special Dungeness crab omelette and I had the garlic special omelette. I’m pleased to say Eggheads was quite generous with both the crab and the garlic! The food is not going to blow you out of the water but it is a good hearty breakfast. There is often a wait for the restaurant but they give you a call on your cell phone so you can wander around town while you wait, which we did. We grabbed coffee at Headlands, which offers a dozen different coffee flavors (pic below) and walked around downtown Fort Bragg which looked like it had been frozen in time. There are tons of unique stores to keep you occupied for at least an hour and also a good number of art galleries. We particularly enjoyed the photo gallery just down the street from Eggheads. 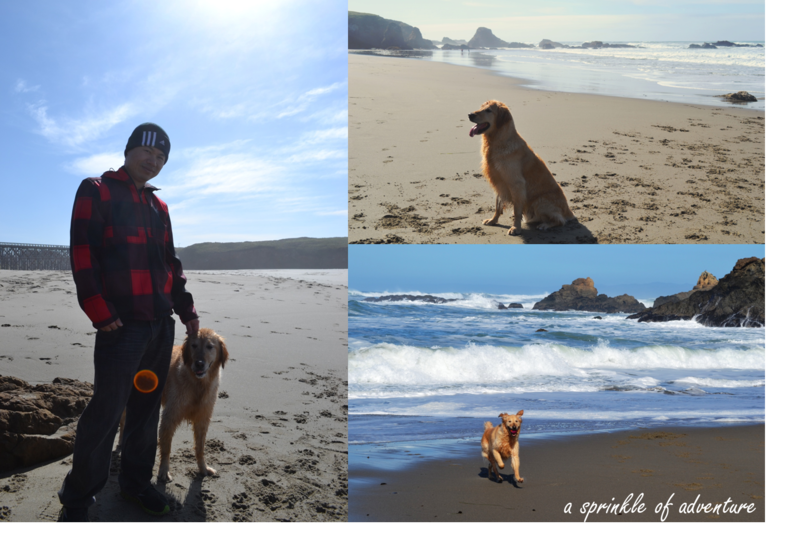 After brunch, we picked up Hansel from the hotel and headed to Glass Beach. The beach is known for the abundance of sea glass from the dumping of garbage many many years ago (back in the early 1900’s). Overtime the beach was cleaned up and the ocean water eventually wore down the glass from discarded bottles into smooth colorful glass pieces. Nowadays tourists go to the beach and pick up the glass pieces as souvenirs even though you’re not supposed to. We didn’t go down to the beach but stayed on the coastal trail walking north. 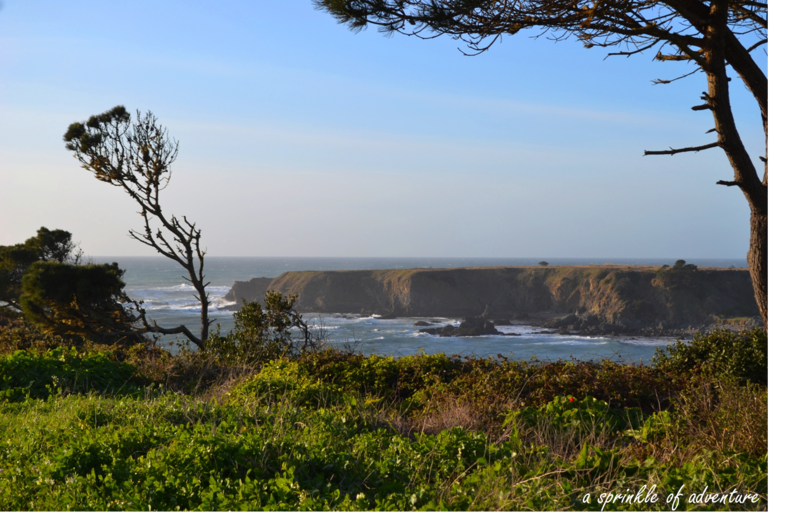 The trail follows the curves of the cliffs and eventually turns into MacKerricher State Park. MacKerricher State Park eventually leads to a dog friendly beach. Hansel definitely enjoyed his time here! The beach was so pristine and there was only a handful of other people around, I can imagine that it would be so nice on a warm summer day. 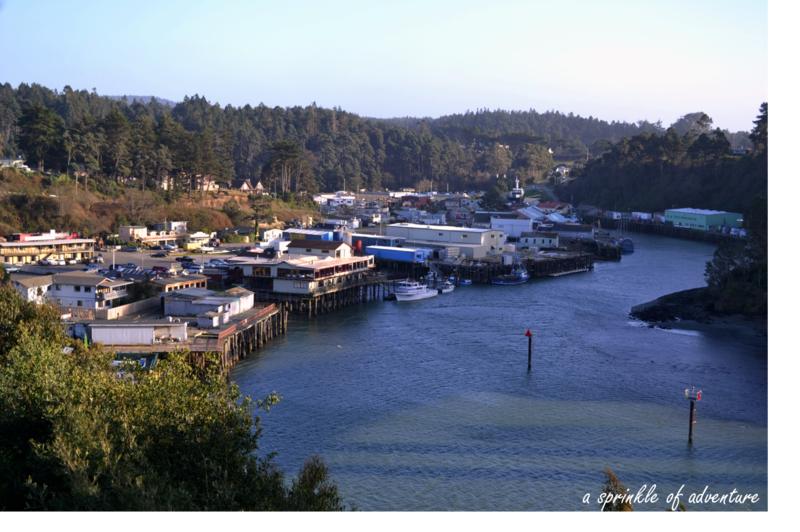 After we sufficiently tired Hansel out, we brought him back to the hotel and headed into Mendocino to walk around town. We grabbed a snack at Frankie’s, which serves pizza and locally made Cowlick’s ice-cream. They have interesting ice-cream flavors like mushroom, ginger, and egg nog. And if you eat in, you can amuse yourself with their “questions people ask”! With questions like “is the mint chip minty?” and “what kind of bread does the ice cream sandwich come with?” it makes you wonder if people really did ask those questions! 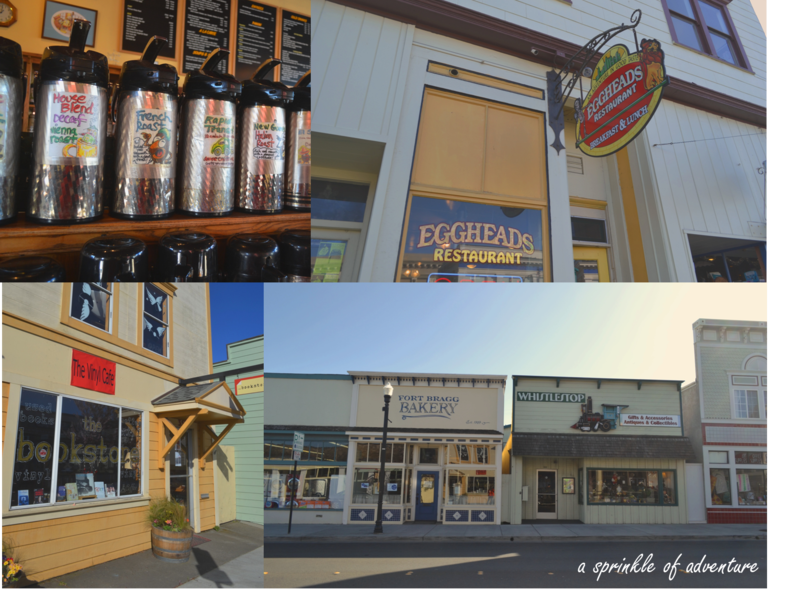 Mendocino is definitely a charming little town full of little boutiques and art galleries. Stop by one of their many fudge shops for a snack. And for a real hidden gem, stop by the Garden Bakery for their pastries, in particular the apple turnover, which was so yummy and not too sweet. It’s tucked away in a little alley with a small garden seating area. We ended our night and our stay with dinner and beer tasting at the North Coast Brewing Co. The food is nothing to rave about and if you must order food, stick to the fish and chips. 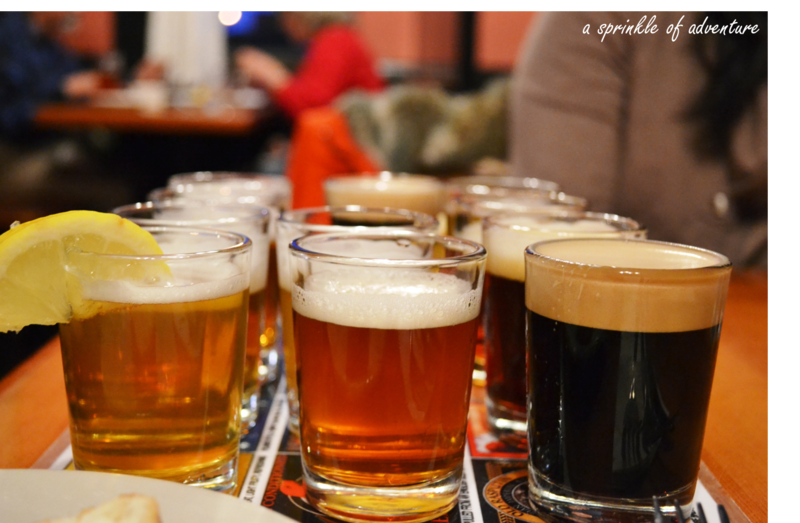 They’re known for their craft beers and their tasting was worth it, $15 for 12 different 4 oz beers. It was certainly a good end to a relaxing trip! 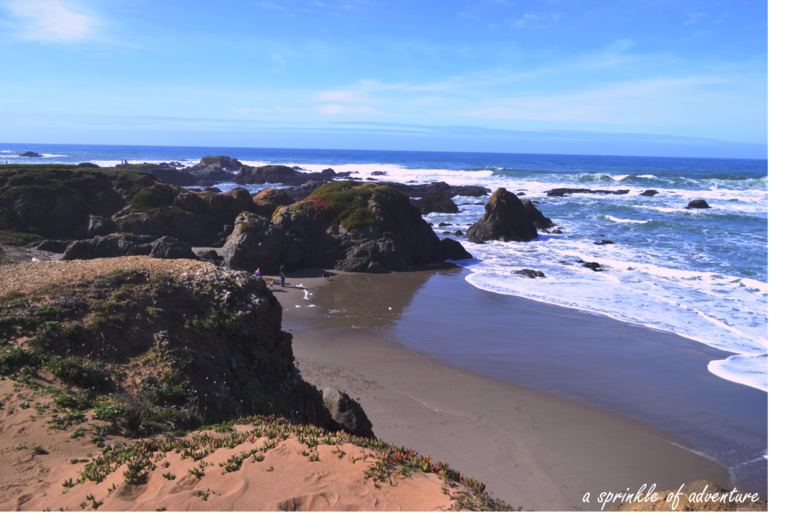 We took it easy in Mendocino but one can easily fill an entire weekend with activities there. The Botanical garden is highly recommended and dog friendly. There’s numerous hiking trails, whale watching trips, and wineries in nearby Anderson Valley too. The best part about it for me was that it was so dog friendly there. 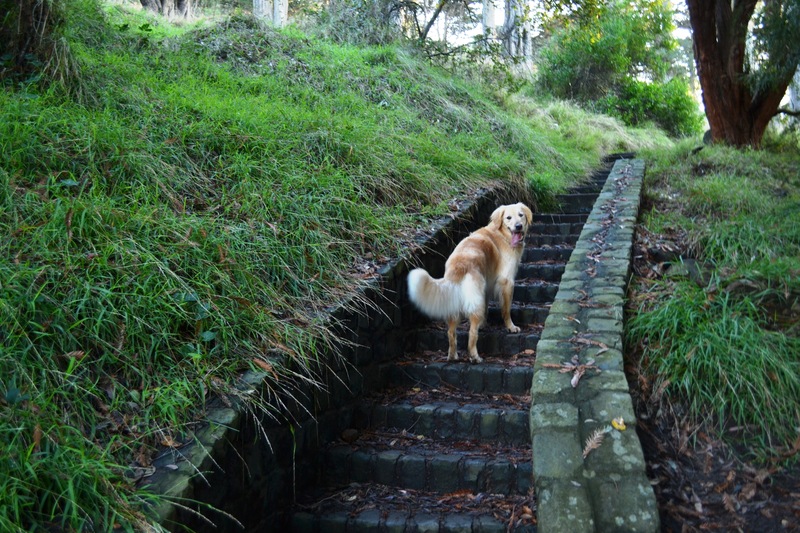 Most of the hotels and B&B’s allow pets and with the abundance of trails, we were able to keep our dog happy as well. 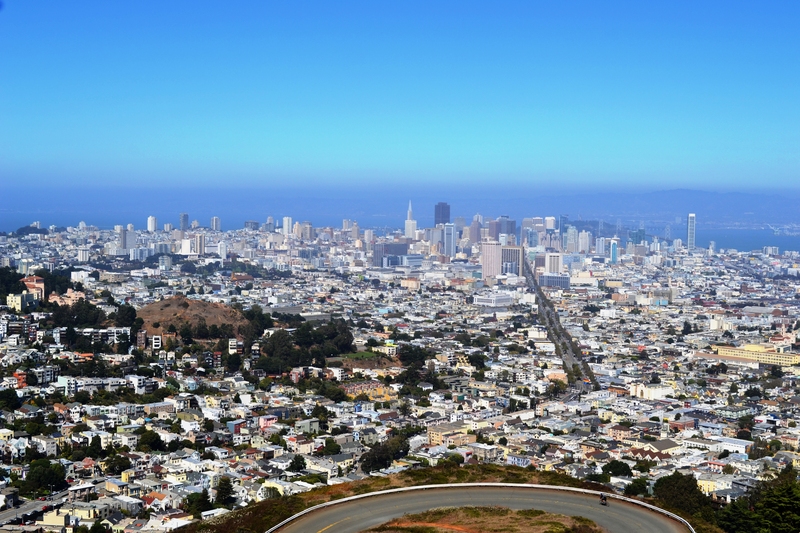 Twin Peaks is one of the highest hills in San Francisco and offers sweeping views of most of the city. On a clear day you can see all of the bay, the Bay Bridge, downtown, the Golden Gate Bridge, and even glimpses of the ocean. Most people will visit the peak by driving or taking a tour bus up there, park, and walk two steps to the observation area. However, if you can, I’d highly recommend walking up to the Twin Peaks summit. From the Cole & Carl St. muni stop in Cole Valley, you can walk over to Clayton St., make a right onto Twin Peaks Boulevard and follow all the way to the top. As you walk through the residential neighborhood, admiring the lovely homes, you’ll get glimpses of the city skyline. The walk is rather steep and it’s approximately 1 mile to the top, but you will be rewarded with awesome views. Afterwards, treat yourself to a delicious brunch at Zazie in Cole Valley or if the wait is too long, head across the street to La Boulange for coffee and pastries. Then round out your day with some window shopping and people watching a few blocks away on Haight Street, best known for the being the center of the hippie movement in the ’60’s. Nowadays, it’s a bohemian neighborhood filled with boutique, bookstores, and coffee shops. It’s also a fun place to go if you want to recycle or trade some personal goods since the street is full of consignment shops and is home to Amoeba Records, which will buy, sell, and trade your used records, CDs, and DVDs. I have a love-hate relationship with the San Francisco hills. Living on top of a hill, it’s always a little windier and chillier than the rest of the city. Not only that, but if I want to take a walk, grab a cup of coffee, or grocery shop, I simply walk down the hill which is all well and good, until I have to drudge up that blasted hill later to get home. I convince myself that my rear will thank me one day, but I have yet to see any changes. However, living in a hilly city also means unbelievable views. I’m constantly amazed that no matter how many hills I climb up, I will always get a different view of the city that takes my breath away. The hubs and I are fortunate enough to live close to Buena Vista Park and Corona Heights, two parks that are literally a block apart but offers a slightly different perspective of the city. 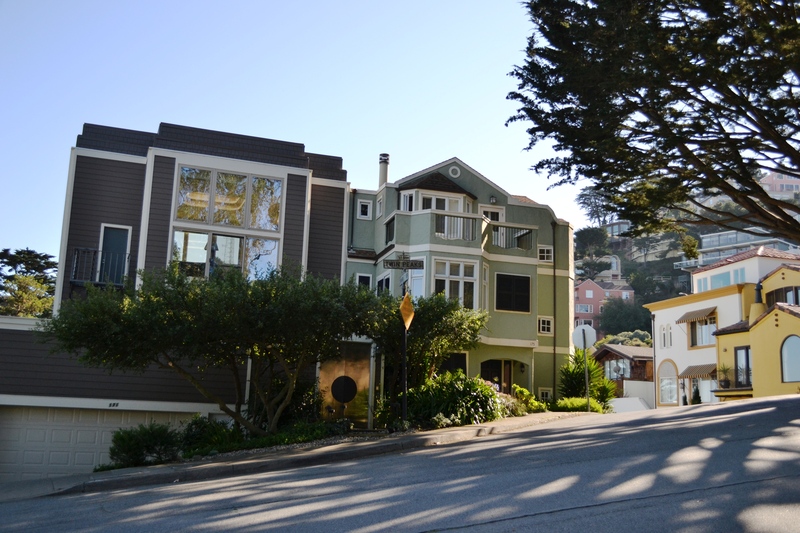 There are several entrance points to the Buena Vista Park, from the bottom at Haight Street, all along Buena Vista Avenue, and also at the top at Upper Terrace. Once you enter the park though, it’s like another world, you don’t feel like you are in the middle of a major city until you get glimpses of the skyline through the trees. Since the park is elevated it makes for a good workout just by walking to the top. There’s paved trails, unpaved trails, and stairs within the park, making for a nice, varied walk. It’s a wonderful park to bring your pooch or if you want some peace and quiet since it’s mostly frequented by locals looking to work out or walk their dog off leash. We have been to the park about every other week since we moved here and we’ve never seen more than a handful of people during our entire walk. There’s also a children’s playground, tennis courts, dog run, and benches sprinkled throughout. It’s probably a 1 hour leisurely stroll to the top and back down again, making for a wonderful way to get some fresh air. 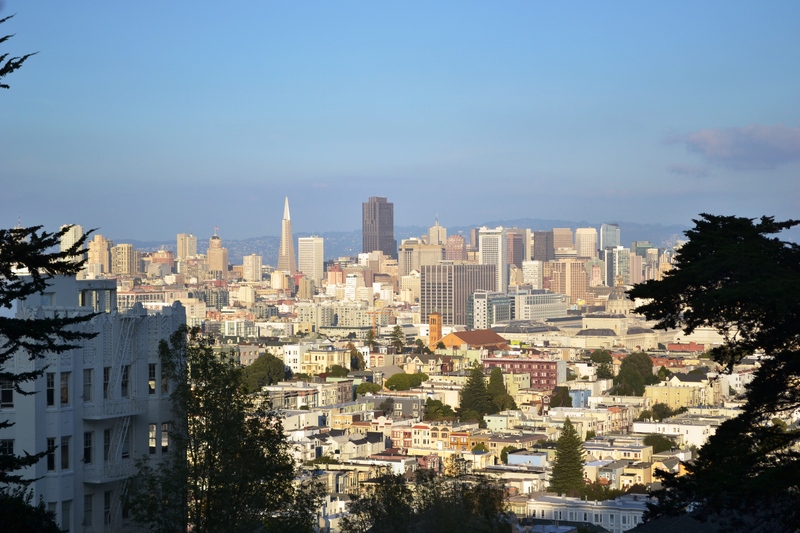 If you have time, exit Buena Vista Park at the Upper Terrace entrance, walk a block to Masonic Avenue, take a left and head straight to Corona Heights Park. 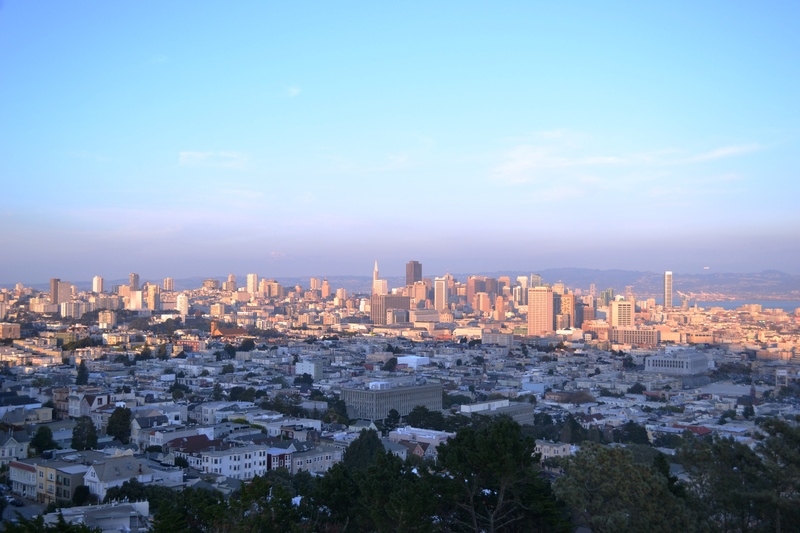 This park is mostly barren, a stark contrast to the heavily wooded park you just came from, but if you climb to the peak, you will have an expansive unobstructed view of downtown San Francisco. Oh my gosh…My first official post! Can you tell I’m excited?!? So I’ve been living in San Francisco for just a little over a month now, and even though I’ve been warned by many people that the summer here can be chilly, I was still surprised to find most days overcast and cold. So when the fog manages to dissipate early morning and the sun is out and the weather is warm, I feel like I have to make the most of it and spend as much time outdoors as possible. 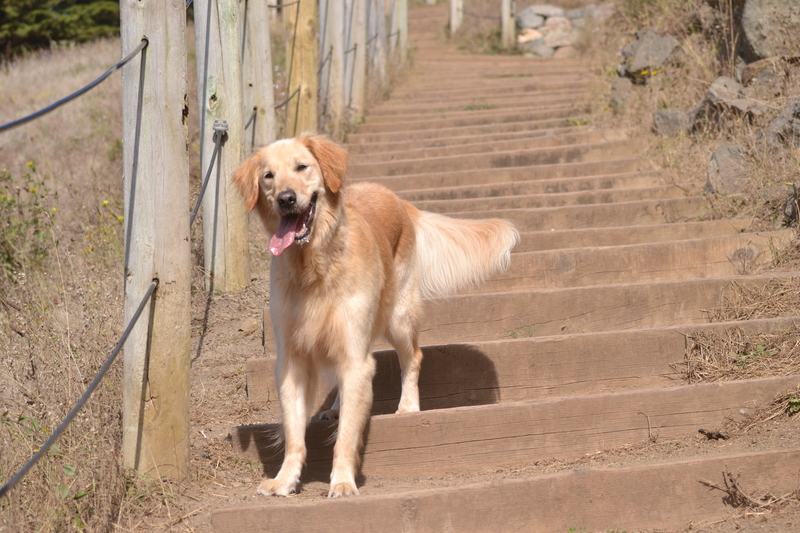 One of my favorite trails to go on when the day is beautiful is the Lands End Trail. 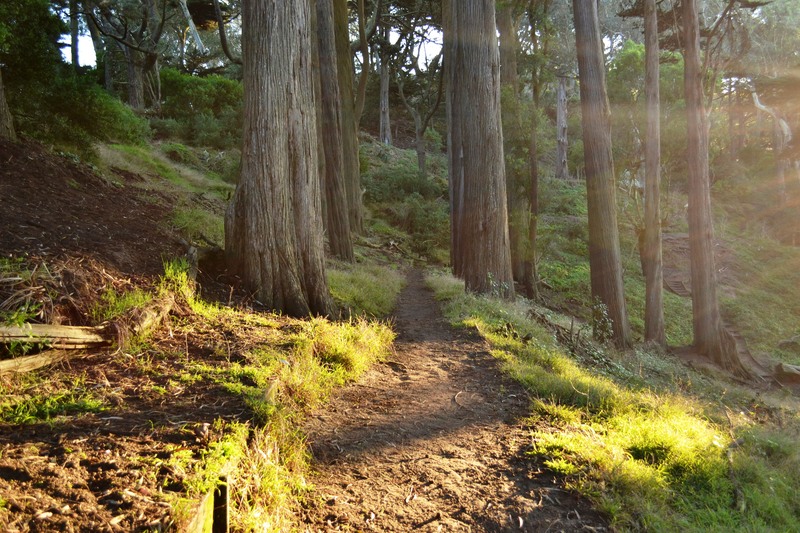 It’s a great scenic trail that’s conveniently located right in San Francisco. I love it because it’s not too strenuous, there’s parking (a rarity in the city! 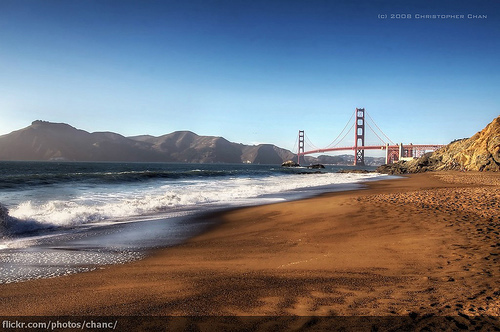 ), and on a clear day, offers amazing views of the Golden Gate Bridge. Also, it’s one of the few places the hubs and I let Hansel off leash for the entire walk, which makes him immensely happy! 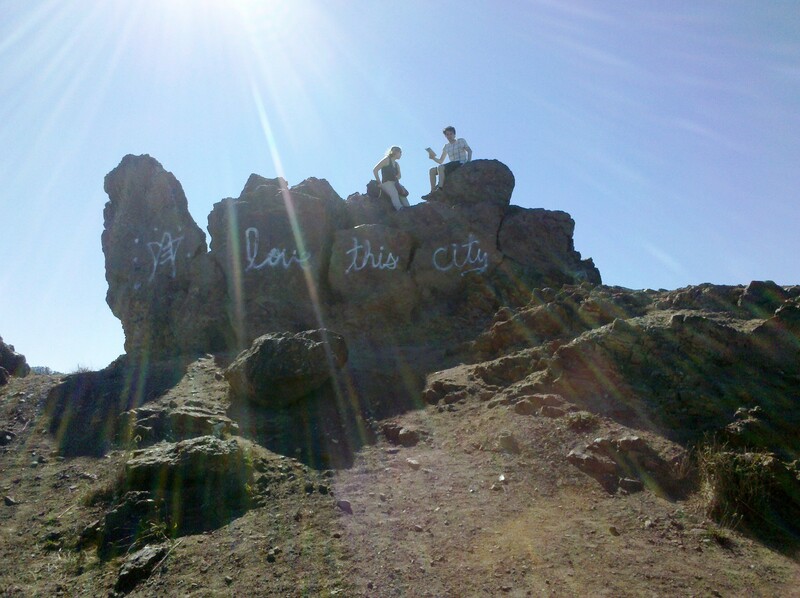 The trail starts off at the Sutro Baths ruins, which at one time was a privately owned swimming complex comprised of 7 pools built into the side of the cliff that overlooked the Pacific Ocean. Unfortunately a fire destroyed the baths and all that’s left are some concrete walls. It’s still a cool site though and I like to imagine what it must have been like back in the day in all it’s glory. 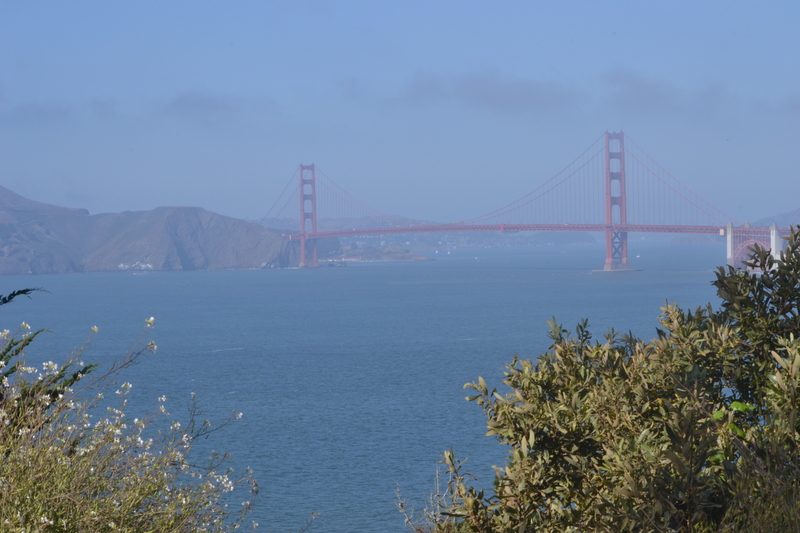 The trail follows the curve of the cliffs and offers beautiful views of the Marin Headlands and the Golden Gate Bridge, as well as beautiful wildflowers all along the trail. Aside from a small stretch of steps that always gets my heart racing, the trail is mostly flat and enjoyable. After about 1.5 miles, you’ll end up in the Sea Cliff neighborhood with signs pointing to various beaches and the Legion of Honor museum. If you’re not too tired and especially if it’s a warm day, I highly recommend going to Baker Beach, which is only about another half a mile and passes through some of the most beautiful houses in San Francisco. Sigh, I could easily spend a few hours there either reading or doggy watching. Including the beach time, you could easily spend half a day here! Although I’ve never been there myself, I’d love to try the Sunday Champagne Brunch at the Cliff House one day. It’s located at the beginning of the trail and would be the perfect prelude to the hike, or treat if you’re an early riser 😉 Champagne, poached salmon, desserts, hiking, beach…Doesn’t it just sound like the perfect weekend?